Coming to BD, DVD and Digital outlets from Arrow films this June, a full tilt, all out revenge thriller, about an amnesiac in a race against time to piece back his identity before a crime lord executes the only person he can trust in the Mo Brothers HEADSHOT. 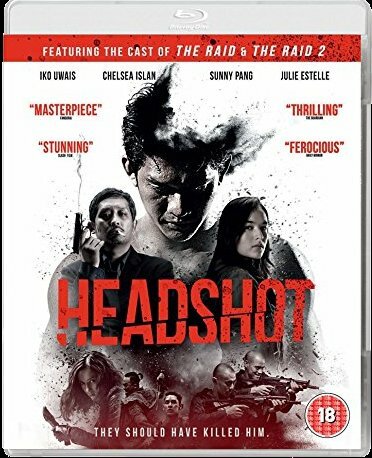 A man (Iko Uwais - The Raid, Star Wars : The Force Awakens) is discovered left for dead with a gunshot wound to the head. After months in a coma, he is nursed back to health by young student-doctor Ailin (Chelsea Islan - Street Society). Realising that the man is an amnesiac, Ailin renames him Ishmael. When Ailin is kidnapped by a gang of dangerous criminals led by enigmatic crime lord Lee (Sunny Pang - The Collector), Ishmael suspects his true identity is closely tied to these people. Determined to save the woman who rescued him, Ishmael has no choice but to confront his past. But every violent confrontation that Ishmael encounters brings him closer to a dark realisation, as a lethal personality begins to awaken within him. Packed to the gills with action and no holds barred violence, with the star of The Raid movies in full-tilt fighting form, this is Crank meets The Bourne Identity for a new generation of action fans. I actually saw this at last years Mayhem festival in Notts and can honestly say, if you like violent, Oriental action films, you'll love this.